Not too bad, considering we are still GREENhorns and started working our Suburban Homestead in beautiful Agoura Hills only about twelve weeks ago. And TODAY, I got my very first berries. 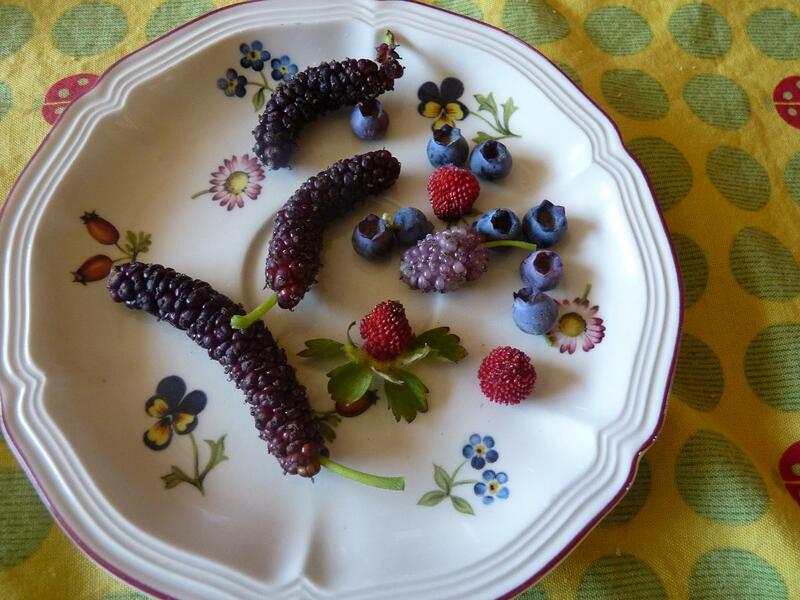 Okay, technically they are already the second batch because Aurelia and Roberto along with the chicks have been munching already some right off the bushes (or trees as far as the Mulberries are involved), but these are the first ones that I got. What you see here are two different kind of Mulberries: The three long dark strings are Pakistani Mulberries, the one pink-whitish looking thing is a White Perisan Mulberry and then we have tiny Wild Strawberries as well as Blueberries. BTW: Mulberries are considered one of the Superfruits, along with Acai and other berries. The reason why most berries make it on the superfruits list is that they are tiny bombs of antioxidants. A true gift of Mother Nature for us to enjoy. Not to mention the amazing taste; if you have never tried a Mulberry, you have not lived! Jon's Nursery of Somis in Camarillo. I cannot say enough good things about Jon and Karen. They are knowledgeable, carry a ton of edibles and their prices are somewhere between Home Depot and Armstrong. AND even though they are not married, they are running this nursery like a Ma and Pa operation, which makes it only more appealing for us to shop there. It also it just plain fun to go there and chat with Jon or Karen, since they are realy close to us. Seriously, we made a pledge to shop them first whenever we need any new plants. Now, I am going to enjoy these beautiful berries all by myself since since neither Aurelia nor Roberto are here. Lucky me! !